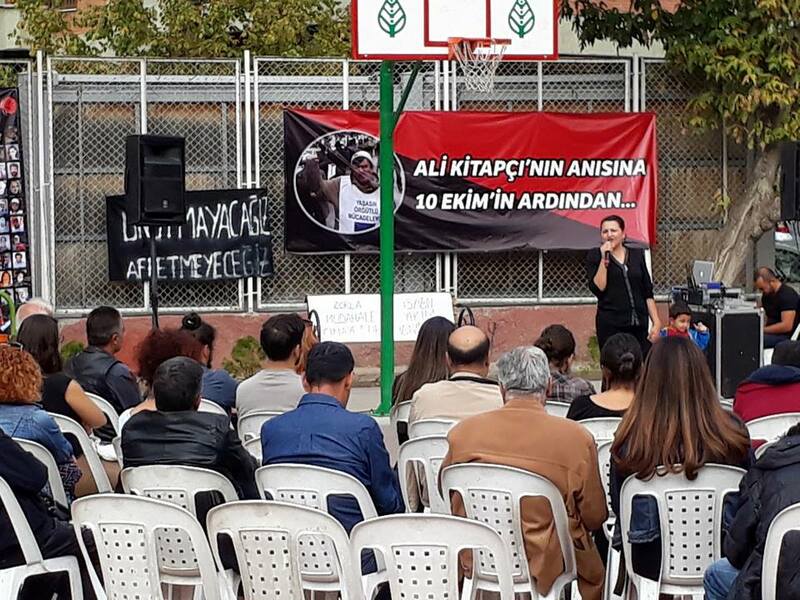 On October 10, 2015 a bomb was detonated as hundreds of youth participated in a “Labour, Peace and Democracy” rally in Ankara, Turkey in protest of the Turkish state’s ongoing repression against the Kurdish movement. 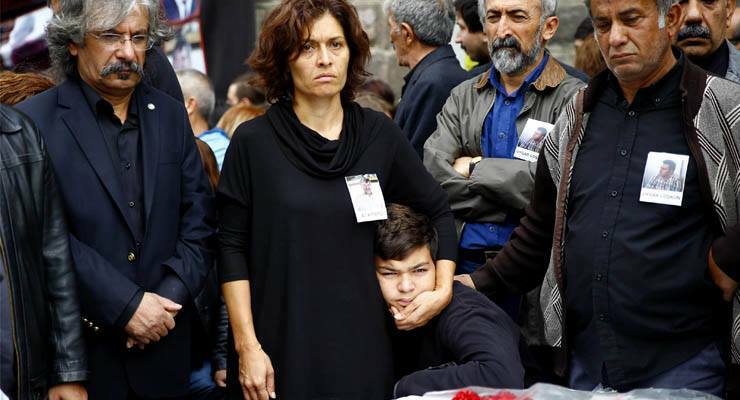 With 103 killed and approximately 500 injured, the authorities blamed the bombing on ISIS but left groups believe that the Turkish state was complicit together with non-state actors. Wiki Entry. We have witnessed the heaviest attack of Turkish history. We had attended the rally on the 10th of October, which was called by the unions and participated in by the revolutionary and democratic organisations, to say “No to the War Between Nations, No to Peace Between Classes”. We lost hundreds of our people and our comrade Ali Kitapçı in the attack of those in power. They painted our red and black flags and banners with blood and flesh of our comrades. Those who steal our lives every day have taken our lives away. Those responsible for the massacre are out there. We know them from Haymarket, Bloody Sunday, Mayday 1977 Istanbul Massacre, Reyhanli, Gezi Uprising, Roboski Massacre, Diyarbakir Dungeons and Suruç. We know them from the daily exploitation of thousands each year. They stand before us merciless, smirking. Those who are responsible are the ones who sent the fire engines to the scene [before ambulances and medical aid], they are the ones who attacked us with tear gas and batons five minutes after the explosion, and the ones who have been looking at us with that smirk on their faces. We know them very well. 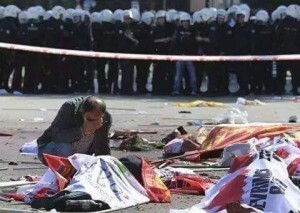 The 10th of October Ankara massacre is an attack targeting revolutionaries and was organised by the state. It is a massacre of the state and the pain is the pain of the oppressed. We know this pain from our workplaces, neighborhoods, schools and all areas of our lives. We know this pain from every area of our lives where the state impacts. At the scene of the massacre, surrounded by riot police. Our word is direct and our attitude is clear against those in power. The state is the murderer, we will not compromise. We will never forget, we will never forgive, we will never give up our struggle. Every bomb they drop on us will be retorted. We will never, ever make peace with those who blow us up to pieces, those who took the lives of our comrades, bury us under the flesh of dead people. We will have the palaces of those who turned our streets to hell destroyed. Those in power who took up microphones in their mansions with a smirk on their faces will regret all their laughter when they come to our streets. They watched our pain while laughing yesterday. They know well that we are in pain. Where they are mistaken and not aware is that we do not mourn for death. Every pain we have, every bullet we are hit with, every life they take away is the fuel for our rage, revolt and fire of struggle. We are burning with pain, we are buried in pain but we are not, ever, mourning. We won’t be silenced and we will not hide and we will not give up. Let them be afraid of our resistance, rage, pain, revolt and the new world in our heart. Their day of reckoning will be terrible. THE STATE IS THE MURDERER, NO PEACE WITH THE STATE! The Murderer State Will Be Held to Account For This! 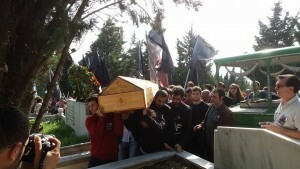 Mourners carry the coffin of construction union activist Tayfun Benol. 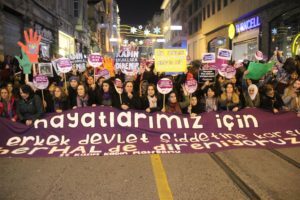 One of the biggest political massacres of the Republic of Turkey took place at the Peace Rally, which had the participation of workers who came from all parts of Turkey. 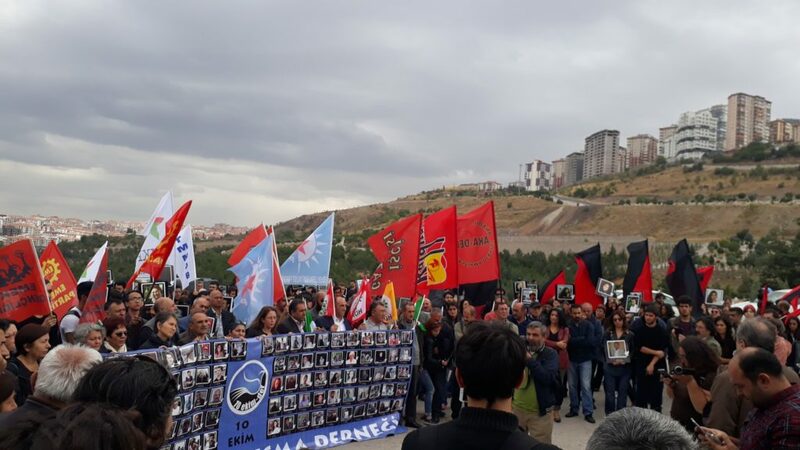 The rally was organized with the call of DISK (Confederation of Revolutionary Workers Unions), KESK (Confederation of Public Workers Union) and TMMOB (Union of Chambers of Turkish Engineers and Architects) in Ankara on the 10th of October. Our sisters and brothers, friends and comrades demanding peace have been murdered; hundreds of them are injured. Although it has been orchestrated by the hands of the ISIS gang, we know that, just like the Suruç Massacre, the state and the AKP that is holding state power in their hands are those who are in fact responsible for this massacre. 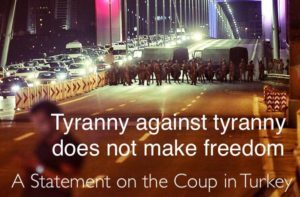 We have seen once again that the AKP is capable of doing everything to hold onto power, and the weaker it gets, the more brutal it will get. The Suruç massacre, dirty war tactics in operations in Kurdish cities, political raids, fascist attacks and lastly this massacre in Ankara show us that those in power are capable of doing everything to protect their power and to drag us to a national and sectarian civil war. And we are late for every day we do not express a strong reaction. If they are doing everything to fuel the war and turn peaceful actions into bloodbaths, we have no other chance but to use the greatest power we have, the power that comes from production, to halt life in order to damn the massacre, to stop the war and to get rid of the murderers. Therefore, the call of DISK, KESK, Turkish Doctors’ Union and TMMOB for a general strike on the 12th and 13th of October is meaningful. However, members and non members of the calling unions and professional organisations should act in unity in order for this call to not become just a symbolic call. 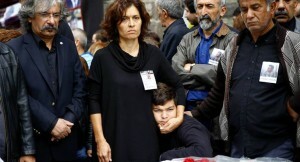 The companion and comrade of Ali Kitapçı, Emel Kitapçı, and their son, during a commemoration of the peace martyrs. We see every day we live that we have no other solution but to accelerate the class based struggle and establish a revolutionary alternative against this system of violence and murder. The more we bow to the daily concerns and fears, the more unbearable our lives become for all of us as the days go by. We are all mourning, filled with rage, and have funerals to attend to in the aftermath of the murder of at least 102 people from all corners of Turkey. Let us not forget that bosses cannot prevent us from attending the funerals of our murdered sisters and brothers who were killed in Ankara. It is our legal and human right to say “No work if there is war and massacre”, to say “No work! We have funerals”. We have that power and we have no other solution, we the hundreds and thousands of people who took to the streets despite all kinds of oppression and threats, who are able to demand peace against all odds. No Work! We Have Funerals. 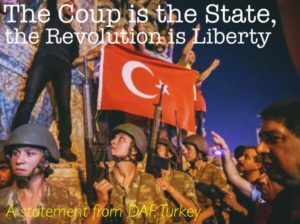 Turkey: The Coup is the State, the Revolution is Liberty!